Improve vocabulary with thousands of new words. Develop word power puzzles and quizzes to test techniques. and join us for summer 2015! Share a link with us! to be Encouraged and Find Hope! Bookmark, Praise, Helpful Hints and more! Everyone is enduring a difficult time in history, confronting negative news daily, as well as social and economic decline. We are looking for something good, wanting a positive perspective on life and we expect it to be real! We want to be able to base our life on it, teach it to our children and to experience good things in life, each day! We want truth. Jesus says the Holy Spirit lives in us and that God loves us! Every effort must be made to share the fact that God’s Word gives hope. We each have a job to do – no matter our age or our position in life! We all need to return to God’s Word and to return to Jesus’ commandments to us. The practical application of this book is that people will study God’s Word, share their food, visit and laugh with each other, create gardens together, motivate one another, respect one another, be better parents, visit with seniors, work with youth and have a heart for their communities. We know that there will be a Christian revival. A revival will be born, because we obey Jesus’ first commandment to love the Father with all of our heart and soul. From the perspective of small children, we love our Father in Heaven. These principles are fundamental to the Hope for Neighbors series of seven books. The books are written in a relaxed, story-telling and conversational style. They are theologically-sound and the content is complete with KJV scripture. 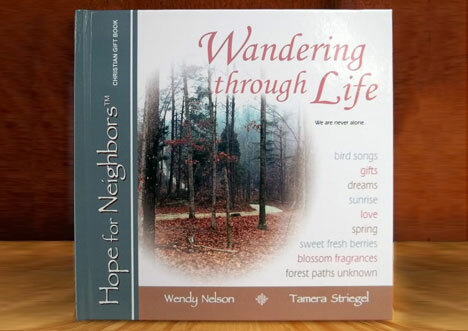 Each book gives practical ideas and coping skills - and encourages the reader to study the Word of God!